Reviews » DVD Video Reviews » Teen Titans Go! - Season 3 Part 1 - Eat. Dance. Punch! Teen Titans Go! - Season 3 Part 1 - Eat. Dance. Punch! A kid-friendly take on DC's younger super team, Teen Titans Go! embraces the possibilities and silliness of animation and runs wild with it, focusing less on heroics and more of the interpersonal connections between these young Titans. For fans of DC, the show is loaded with little easter eggs and in-jokes, making it a treat for comic book and cartoon aficionados. Three seasons have aired to date, with four half-season DVD collections and one complete Blu-ray collection released so far. DVDTalk has reviews of several of these releases. The show is about a group of superheros named the Teen Titans that save Jump City from total destruction. Every episode is either usually a lesson they learn, an adventure they go on, or just total randomness! "Cat's Fancy" is about Starfire. Starfire becomes a cat lady and becomes obsessed with cats. Robin wants Starfire to like her so he dressed up like a cat. Robin's plan gets a little too crazy. To stop Starfire from going crazy he dresses up like a dog and randomly that makes her normal again. "The Fourth Wall" is about when the Titans' TV gets hacked by Control Freak and he forces them to change themselves or he would reboot them. The Titans change themselves in many ways. But Control Freak tricked them the whole time. "The True Meaning Of Christmas" is about the Titans...well..learning the real meaning of Christmas.The Titans find out that they haven't been getting presents for 3 years straight was because they were on the naughty list. 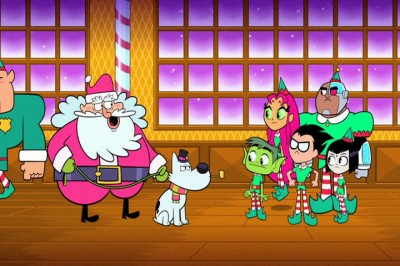 So the Titans go to the North Pole to erase their name from the list. But Santa tells them the real meaning of Christmas isn't presents, it's spending time with family...but after they blow up the workshop santa finds out the real meaning of Christmas is really presents. I really can't think of a good one that really stood out to me they all were really good. I have really only four words to describe this: money, weird, LOL, why. My daughter got me to watch Teen Titans Go! with her on weekend mornings, and it was quickly obvious that this was a show that appealed to my sense of humor. The series is utterly self-aware, to the point where the characters at times refer to past episodes as episodes. 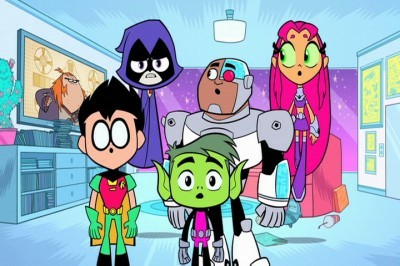 One entire episode, "The Fourth Wall," has the Titans come to understand they are being watched by an audience, while another, "Squash & Stretch" has the characters confront the idea of cartoon violence, only to embrace it by altering the series' visual style in order to make excessive violence more acceptable. Teen Titans Go! fully takes advantage of its medium, and explodes with creativity, from little touches like silly intertitles explaining time jumps, to imaginative animation that's gorgeous and wacked-out all at once. For little ones, the show isn't always appropriate, with several questionable messages and general bad behavior on the part of the Titans (with Beast Boy's habit of calling every female "mama" coming off as weird and.or creepy.) "Leg Day" is just plain disturbing, as the Titans go from fetishizing their upper-body muscles, to obsessing over their legs, and neither is comfortable to watch (making one wonder about some sort of Ren & Stimpy inspiration at work.) This isn't the most moralistic show, and it often doesn't really care much about plot either, with episodes randomly ending, like "A Farce", which, if you're paying attention, ends on a note that suggests the Titans are about to all be killed. Will they notice all the naughtiness? Maybe not. But it's hard to miss some of the stranger stuff happening in Jump City. It would be wrong to not give special mention to "Finally a Lesson," easily one of the oddest episode of a kids cartoon ever. 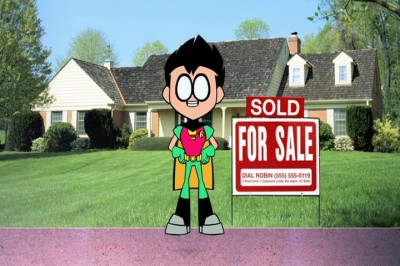 In this 11-minutes of weird, Robin walks the other Titans through a plan to purchase an apartment building and then rent the units in order to make money. It goes into legit detail about the process, including explaining the concept of equity, the idea of mortgages and the challenges of rent control. I kept waiting for the joke, and eventually realized it was on us. As noted above, it was also easily my daughter's least favorite outing in this set. But hey, now she understands a bit more about real estate. This set of Teen Titans Go! episodes is split between 2 DVDs, which are packed into a standard-width keepcase with a tray for the second disc. It's a bit of an odd assortment, containing episodes 1-25 of the third season, and then episode 30. The DVDs offer Warner Brothers' standard static anamorphic widescreen menus with options to play all the episodes, select shows and adjust the setup. Audio options include English, Spanish and Portuguese Dolby Digital 2.0, while subtitles are available in English and French. Annoyingly, even if you use the play all option, every episode plays with the full titles and credits. While the bright colors and blend of live-action photography and animation deserves to be seen in HD, the anamorphic widescreen transfers here are good to go, with bright, vivid color throughout and good fine detail. The image is a touch softer than the show looks in its original HD broadcasts, but digital distractions are not an issue. The Dolby Digital 2.0 audio tracks offer no concerns, delivering the dialogue crisply, without any distortion, while enjoying solid separation from the energetic music and sound effects. While it would have been nice to get "The Night Begins to Shine" in a surround mix, what's here is problem-free and a solid listen. There are no extras, but I would have liked to see some included. Possibly some games or mini-features. Teen Titans Go! is very enjoyable and I recommend it to ages 7-17, maybe older? It has a LOT of comedy and is very funny. I just started watching the show last year and I was hooked ever since! If I had to rate it 1-10, I'd rate it a 9 1/2! A true family pleaser (for families who have outgrown younger fare), this series is a blast to watch, and these discs, though not high-definition, so look and sound quite nice. Some extras would be nice to enhance the value, but being able to return to these episodes whenever for a relatively low cost is worth it.